Over the past couple of weeks I've been working on the new Mac version of bliss. The beta testers have been finding some good bugs, so it's not quite ready for release yet, but in the meantime I've been improving things for Windows, Linux and VortexBox users too! I also tweaked how custom file organisation patterns work. Before, you would specify ".<fileextension>" at the end, so that .mp3, .flac or whatever is appended. I've changed this to be implied, that is you don't need to specify ".<fileextension>". bliss assumes it is required, and handles adding the music file extensions for you. 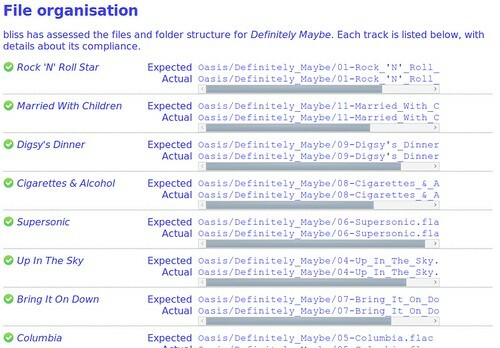 Performance of bliss, as it assesses very large albums, has also been improved. Get the new release from the downloads page!